Growing up, my dad had this rule: we didn't travel for Christmas. Everyone, every year, was welcome at our house which often meant we had a tiny house filled to the brim with people - mostly, my immediate family of five and my grandparents, my Nana & PopPop. They would either come a few days before Christmas or Christmas day and bring loads of gifts and a cooler full of annual Christmas treats. Nana always made a few things: chocolate candy with marshmallows (which I never loved...shhhhh...don't tell anyone), homemade spicy snack mix, and my favorite: garlic cheese. 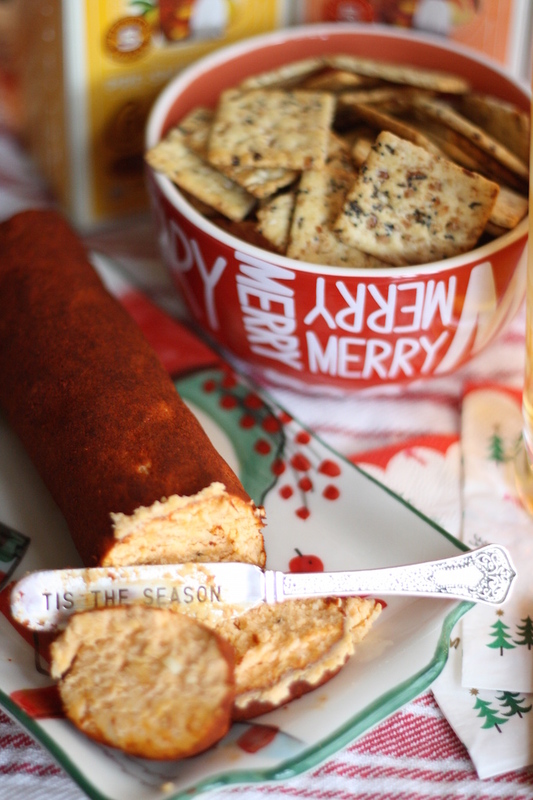 We would immediately dig into the cheese with any crackers we happened to have on hand and of course, pour a tall glass of sweet tea on the side. Eventually, Christmas became synonymous with garlic cheese. My Nana passed away earlier this year, and this will be our first Christmas officially sans garlic cheese. So, I set out to try the recipe for myself. I had worked it up in my head as though it was going to be this crazy involved recipe that I'd never be able to accomplish. Well, it turns out that it's not complicated at all. I'm not sure I've mastered her flavor profiles - you know how grandmother's are "just a pinch of this or that" without any exact measuring. Ironically, I cook the same way, so I can't complain too much. This garlic cheese is perfect to have on hand in your fridge, especially in the coming days and weeks leading up to Christmas. I like to keep snacks like this on hand for any unexpected guests. I also make sure to have a variety of beverages on hand, too. 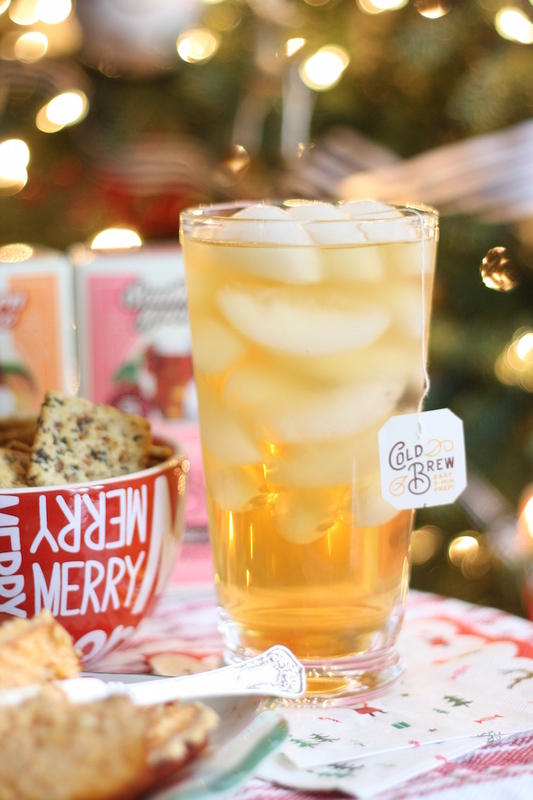 One of the best beverages I've discovered is Southern Breeze's Cold Brew Tea. They're perfect because in just under 5 minutes, you can have freshly brewed sweet tea without the hassle of boiling any water. You simply steep a single serve, zero calorie (!!!) tea bag in cold water and let it sit for a few minutes. While you're waiting for the tea, you can assemble a festive platter of the garlic cheese and a bowl everything crackers for a quick visit with friends or family who pop-by. I wanted to share the recipe for garlic cheese with you today. It really is so simple, and I hope you give it a try! Happy holidays and happy snacking! 1. Set-out cream cheese to soften. 2. Shred block of sharp cheddar using a food processor and cheese grater attachment. If you don't have a food processor, you can grate by hand. 3. Once cheese is grated, remove cheese and set aside. Swap your attachments in your food processor back to the regular blade. 4. Add half of the cheese back to food processor. Add half of the block of cream cheese and pulse. 5. Repeat step 4, leaving original mixture in processor. 6. Add garlic, red pepper, and pepper. Pulse one final time. 7. Remove cheese mixture and shape into 2 equal sized logs. 8. Pour paprika on a plate (or other flat surface) and roll logs in paprika until covered completely. 9. Wrap cheese in parchment or saran-wrap and refrigerate. Note: Get creative with your roll - you can roll in pecans or even curry powder!